This report will show that our world does not only consist of Europe, Asia and the USA. No, there is an other world, that some people forget sometimes. A land or better a continent that lays on the other side of the globe. 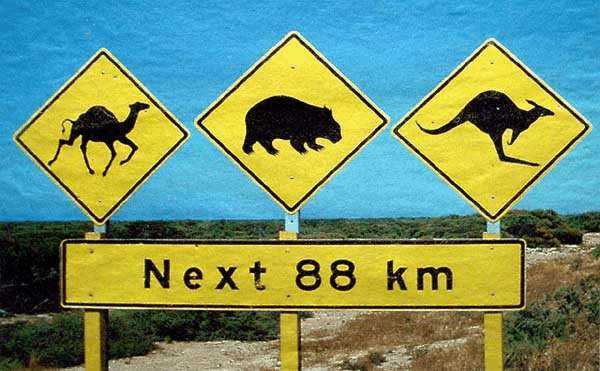 Australia or better Down Under. Australia, the smallest continent and at the same time the biggest Island of our world. A overwhelming land full of wideness and emptieness. Unbelieveble colors, mostly the green of the jungle in the south, the blue of the ocean at the Great Barrier Reef and the red desert in the interior, e.g. near Ayers Rock. The Land of the Aborigines and their mystical life and the land of animals like the koala or kangaroos and trees like the eucalyptus. Australia, that means gentle inhabitans, who call themself "Aussies" , not to forget room for everyone. So in some regions not persons per square kilometres are count but square kilometres per person. On an area, as big as Europe or the USA, where only 17mill people live, half of them in big cities like Sydney, Melbourne and Perth. In the Interior, the Red Center, where the big red deserts are, but not to forget the west- and northcoast, or short in the famous Outback, hospitality and helpfulness are written in big letters, because nobody could survive there alone. Australia consists to nearly 75% of this Outback. It is unbelievibal dry and hot but at the same time facinating beautiful. In the red center one finds huge dunes which look like a moved see. But their is not only the outback also zivilisation. With 7.686.848 km², Australia consists of an area nearly like the USA. But it is only setteled by 16.8 mio. inhabitants, 74% are Roman Catholics. Canberra is Australians capital since 1927, before that was Melbourne. The country consists of 6 states, namly Victoria ( the smallest ); New South Wales ( the oldest ); Western Australia ( the largest ); Queensland ( the second largest ); South Australia ( the driest ); Tasmania ( the most beautiful ) and 2 territories, The Northern Territory and The Australian Capital Territory. Victoria, the smallest state, has a strong industry but also farms in the south. It`s capital is Melbourne, the home of the Australian Open, everybody knows. Victoria has 3.2 mio. inhabitants. The oldest state is also a very rich one. New South Wales is famous for it`s chemical and mechanic industry. The capital of New South Wales is Sydney. Perth is the Capital of the largest state, namly Western Australia. 3/4 of the whole australian gold mines are in Western Australia. Queensland is the second largest state and the economical center of Australia. In 1988 the EXPO was in the capital of Queensland, Brisbane. It is the sunniest town of Australia. The cultural center is South Australia with 1.1 mio inhabitants and its capital Adelaide. It is also the driest state, but produces much of Australia`s wine. Tasmania is the only island state of Australia but the most beautiful. E.g. the facinating coastline with its many scenic capes and bays. Not to forget the both territories. The Northern Territory with the capital Darwin and its magnificient countryside. 1/4 of the population are Aboriginies. As well as The Australian Capital Territory, this is Canberra, and has a population of 299.400 people. Australia has not only one climate. There are two different climates. First the hot and wet climate in the north, all the year, with its tropical trees and grass Savanas also, near the coast, rainforests. And the warm summers & mild winters in the south. So the south has the same climate as Europe. In 1770 James Cook landed on the east coast of Australia and called the place he found Botany Bay, because of the many flowers. For 17 years after Cook disscoverd Australia, the English did nothing with their colony. But the American War of Independance and great social problems, during the 18. Century, in England forced the English to change their policy. The prisons became overfilled and the judges became stricter. Prisoners were send to North America, but after England lost their American colonies the English turned their attention to Australia. First they used Australia only as a prison colony. 1793 the first free settlers arrived at Australia. The regular settlement starts in the middel of the next century. 1830 the first expedition in the interior was done. Since 1901 Australia is an independent country but still a member of the British Commonwealth. So the british Queen is also the Australians head of state. The Aboriginies, those are Australians nativ inhabitants. Aboriginies comes from ab origine, that means nativ inhabitant. The Aboriginies live in harmonie with the nature. They are hunters and collecters. For this they have special weapons, e.g. the womerah, thats a kind of spear-sling and the boomerang. They live in tribes with 500-700 Aboriginies. Ca. 380000 Aboriginies still live today in Australia. Unfortunately the most only see this one, which live on the streets an have big problemes with the zivilisation. The Uluru ( schattiger Platz ) lays in the middel of Australia and is better known as Ayers Rock. It is a big sandstone monolith admist the red center. It is the second biggest Monolith of our world, after Mount Augustus in West Australia. His beauty and the variety of colors, he has, through the whole day is facinating. The Uluru is 4.5 km long; 2.5 km wide and 348.7m high, and this is only the smallest part. The most is underground! The Uluru is also the holy place of Aboriginies. Thats the reason, why it is prohabitat to climb Ayers Rock. Already 10 o`clock it is unbelivibal hot at the top of Ayers Rock. An other natural wonder is the Great Barrier Reef. It extends along half of the east coast. The Barrier Reef is 2000 km long and consists of 2500 little reefs. There are more than 1500 species of fish. It is the biggest reef complex of the world. 600 islands attends the Great Barrier. People can have diving courses at Great Barrier. They have 4 diving tours, which take 60 minutes, than. More is unpossible, because of physical aspects. The human individum couldn eliminate the nitrogen, which is getting in the blood, in the depth just slowly.